"We as human beings have to come together to save our earth for our future generation"
Kamehameha's sons and grandsons continued to rule his unified kingdom in the decades following his death. Kamehameha III did much to codify Hawaii's traditions and laws along a Western model. The act called the Mahele allowed private ownership of land for the first time. Lands historically controlled by the king and other ali`i were formally divided and commoners were given an opportunity to claim their traditional family (kuleana) lands. Due in part to different cultural notions of property, many claims were never established and foreigners were able to acquire large tracts of land. Epidemics were another sorry note that accompanied native land dispossession. Unaccustomed to foreign germs and viruses, Hawaiians fell to foreign diseases in staggering numbers since the first arrival of Westerners. The trend of sickness and death continued throughout the 19th century. 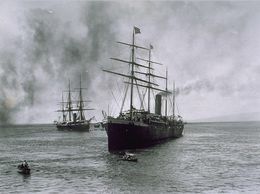 With the consolidation of land property and entrepreneurs looking for alternatives to the diminishing whaling industry, sugar entered the economic picture. Cane fields were planted and with the building of mills for the harvest, a new industry was born, one which had far-reaching consequences for Hawaii's history. Sugar soon became the dominant industry on all the major islands. The demand for labor soon outstripped the local supply, and workers were recruited first from China and Japan. They were followed by Portuguese, Koreans and Filipinos in the late 19th and early 20th centuries. Although many workers returned to their home countries at the end of their contracts, those who stayed gave Hawai`i a truly multi-ethnic society. The sugar harvest drove planters to technical innovations. They engineered vast water projects and invested heavily in reforestation to preserve watershed areas. Sugar planters collectively funded agricultural research and tested new growing methods. Sugar profits depended on foreign market availability. Hawai`i sugar brought large profits during the American Civil War when northern markets could no longer access southern sugar. In 1875, Hawai`i secured a reciprocity trade treaty with the United States. The treaty opened an era of vast profits for growers that translated ultimately into greater political clout. Through the 19th century, Hawai`i continued as a fledgling kingdom, maintaining its sovereignty despite designs by the British, Russians, French and Americans to win control of the Islands. Hawaii's monarchs successfully played American and British interests off each other, depending on one then the other for military support. Toward the end of the 19th century, sugar growers and American businessmen in Hawai`i were increasingly disgruntled with the government. They finally took matters into their own hands, bringing about the overthrow of the monarchy. Hawaii's last queen, Lili`uokalani, withdrew from the throne to avoid bloodshed but did not immediately abdicate her title. The usurpers hoped for quick annexation by the United States but had to wait five years. In the meantime, they established the Republic of Hawai`i with a government following the American model.